A backdoor, also known as a trapdoor, is a way to access a computer software without getting detected or stopped by security programs installed on the PC. This term can refer to both the legitimate means of access as well as the applications that are used for remote attacks by hackers. Legitimate undocumented backdoors are used in order to allow the administrator to enter a computer system for troubleshooting, upkeep, or other reasons. Secret portals that are used by cyber criminals, on the other hand, can allow them to enter computers for malicious purposes. Built-in legitimate backdoors are generally used for maintenance. Some of them are protected by a username and a password. In most cases, users have no idea that these backdoors exist, and only the makers of the programs are aware of them. Backdoors were a hot topic back in 2013, when Edward Snowden released the information about the NSA’s effort to make companies install backdoors into their software. These backdoors would allow the intelligence agencies to enter systems unnoticed and access the data necessary to them. Although administrative backdoors also create vulnerabilities in software and systems, the real trouble comes when hackers install their own backdoors onto the computer. 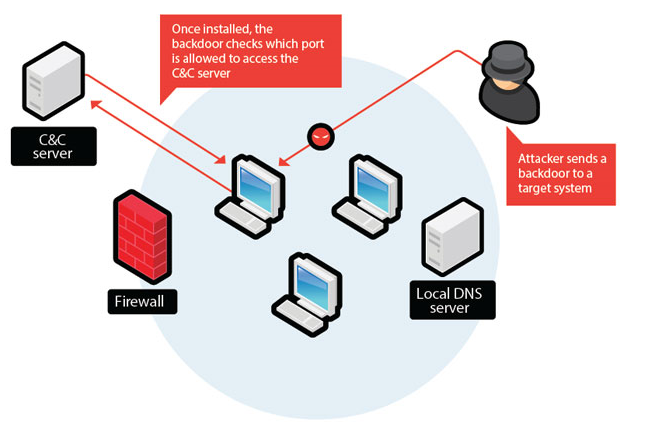 Cyber criminals can use backdoors in order to access the system without the user’s notice and steal their personal data as well as drop other malicious applications onto the PC. Both of these actions can lead to serious consequences. If cyber crooks gain access to the user’s personal information, this can result in identity theft or financial losses, while the addition of other malware onto the computer could result in system damage, data corruption, browsing issues, and more. What should be a priority for computer users is that they install reliable anti-malware tools capable of detecting backdoors and eliminating them from the system and keep these tools updated. This would ensure that they do not have to deal with the above-mentioned problems. If you think that there may be malicious programs on your PC already, you should download and implement the malware prevention and removal tool as soon as you can. It will help you detect backdoors and other threats, clean your computer, and keep it safeguarded from future attacks.